Proper fit starts with the liner...the hybrid comfort liner comes with the all new Radar leather jacket. A combination of breathable/windproof materials & Lycra® stretch paneling allows the liner to conform to you! The Hybrid Comfort Liner is designed for proper fit, comfort & mobility. Fit of these jackets is pretty standard. Use the chart below to select a jacket size that would be big enough for both your chest and belly. If you have a big chest (relative to your waist), use the side waist adjustment belts to cinch the waist down to get a good fit. For more sizing help, please see Joe Rocket’s Sizing Chart. The Joe Rocket Radar jacket combines the cooling capability of a mesh jacket, with the fit, style, and protection of a leather race jacket. 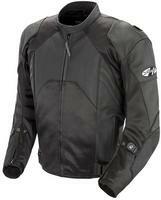 Mesh jackets are generally regarded as less protective, and leather jackets are usually pretty warm in the summer. The Radar gives you the best of both worlds, in a jacket that is actually quite comfortable too. Thanks to the mesh material along the inner arms and large stretch panels behind the shoulders, the Radar is very comfortable right out of the package. There is good freedom of movement and the cut is sporty without feeling too restrictive. There is CE approved armor in the shoulders and elbows, as well as an aerodynamic speed hump. The speed hump has two functions: One, it helps with aerodynamics at high speed, and two, it provides a bridge between your back and the back of your helmet, preventing neck injuries. There is a foam back pad included. The liner in the Radar jacket is very unique also. The material is thin and should do a good job blocking the wind in the front of the liner, and the back is made mostly of a stretch Lycra material. This liner is quite comfortable; with stretch material in all the right places it’s hardly noticeable. The Radar jacket will be best suited to warm weather riding, while the liner will help keep you comfortable down into cooler temperatures. We have taken quite a few pictures of the jacket here in our studio, so be sure to click the “View Large Images” link above. Note: Like this jacket but don’t want a speed hump? Check out the “Dark” version by taking the link below. Fast shipping, wasn't sure about the hump but it gives the jacket a little more racing look. Very stealthy and replacement of my mesh leather jacket, feels like more protection for going down with mesh venting for cooling.